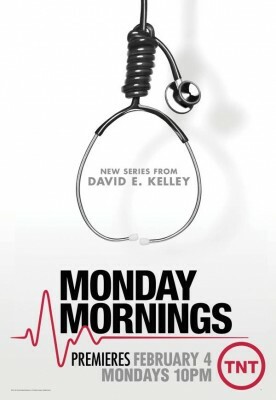 While there have been many successful medical TV shows, that’s no guarantee that a new one like Monday Mornings won’t be cancelled after one season. Has TNT found a new ratings smash, a moderate success, or a candidate for easy cancellation? We’ll have to wait and see. The show’s cast includes Jamie Bamber, Jennifer Finnigan, Bill Irwin, Alfred Molina, Sarayu Rao, Ving Rhames, Keong Sim, and Emily Swallow. Below are the most recent ratings for the Monday Mornings TV series on TNT. The show’s ratings are the best way to tell if it will be cancelled or renewed for a second season. Monday Mornings airs on Monday nights and there are 10 episodes. UPDATE: TNT has cancelled Monday Mornings after one season on the air. Final season averages: 0.3 rating in the 18-49 demographic with 1.39 million total viewers. 0.3 demo rating (-25% change) with 1.37 million (-15% change). Season averages: 0.32 in the demo with 1.39 million. 0.4 demo rating (+33% change) with 1.60 million (+21% change). 0.3 demo rating (0% change) with 1.32 million (+8% change). Season averages: 0.31 in the demo with 1.37 million. 0.3 demo rating (-25% change) with 1.23 million (-34% change). Season averages: 0.32 in the demo with 1.37 million. 0.4 demo rating (+33% change) with 1.86 million (+28% change). Season averages: 0.32 in the demo with 1.40 million. 0.3 demo rating (0% change) with 1.45 million (+17% change). Season averages: 0.30 in the demo with 1.30 million. 0.3 demo rating (0% change) with 1.24 million (0% change). Season averages: 0.30 in the demo with 1.26 million. 0.3 demo rating (0% change) with 1.25 million (+2% change). 0.3 demo rating (0% change) with 1.22 million (-9% change). Season averages: 0.30 in the demo with 1.28 million. 0.3 rating in the 18-49 demographic with 1.34 million total viewers. Season average: 0.30 in the demo with 1.34 million. This was not a good start for Monday Mornings. It was the lowest TNT scripted debut in more than a year and lost 40% of lead-in Dallas’ audience. What do you think? Do you like the new Monday Mornings TV series? Do you think it should be cancelled or renewed for a second season? I have been searching for DVD of the series of Monday Mornings. I thought this was a wonderful show and would like to be able to share it with my Healthcare students. Please let me know if there is any way this can be purchased in DVD form, Thanks. Wow…hard to believe this excellent TV series was cancelled! It is geared more toward an intellectual, deep-thinking audience…….apparently in the minority in the U.S.A. Equally amazing to me is how goofy, low-IQ TV shows that are more appealing to 12-year-0lds navigating the rapids of puberty survive and continue to be aired on TV. Monday Mornings was a breath of fresh air….TNT certainly disappoints me! !